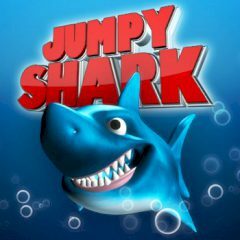 Jumpy Shark seeks for adventures at the bottom of the ocean and fortunately, there are many things to do. Dodge bathyscaphe's, naval mines, tubes and other sharks, but don't forget to collect diamonds and eat small fishes. The bottom of the ocean is full of many wonderful and lost things. There are naval mines, old tubes and weird octopuses that seems unfriendly, but there are also things that might be useful for you. Collect gems and small fishes to increase the amount of points and restore your health. How far you can get jumping somewhere deep in the ocean?